Steel and aluminum tariffs were formalized Thursday, March 8th after being originally announced a week before. These blanket tariffs, 25% on steel imports and 10% on aluminum imports, come in response to the Section 232 investigation and go into effect in 15 days. The “232 tariffs” cut across a broad array of products and are passed on a basis of national security concern. The major difference to the formalized tariffs from first proposed is an exclusion to NAFTA members, Canada and Mexico. It also seems as though the U.S. is “open to removing or modifying individual tariffs on countries” on a case-by-base basis. 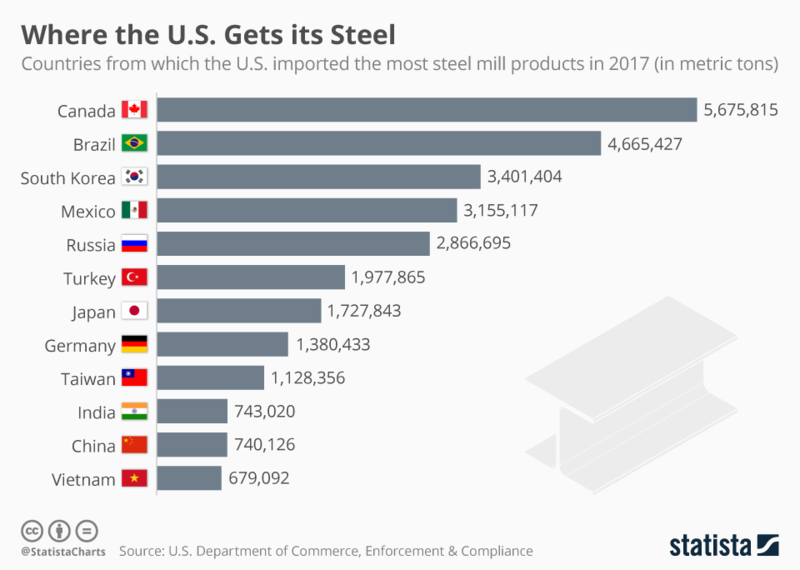 This NAFTA exclusion is of particular importance as Canada and Mexico rank 1st and 4th respectively as the top countries of which steel is imported from. China has long been accused of flooding the market with cheap steel. For the U.S., China is just the 11th largest import country for steel. It is clear though that much of the global increase and a large reason for the steel and aluminum tariffs is production and capacity from China. Since 2000, almost all of the increase seen can be attributed to them as seen in a recent Wall Street Journal article. Some lawmakers and members of the U.S. steel industry are applauding President Trump for the measures he took. In the immediate days following the tariff announcement there has and will continue to be a flurry of expectations and predictions. On the same day as the tariffs were formalized the Dow Jones Industrial Average dropped over 400 points, its worst single day decline in three weeks. Large corporate consumers of steel and aluminum were also hit hard by the news. Boeing, Ford and GM all experienced 3-5% declines through the close of the market Thursday and continuing through Friday. For automakers, they were already entering 2018 on lowered expectations. Following seven years of growth, 2017 marked the first time new car sales declined since 2009 and 2018 is projected to decline further from the 2016 high water mark. Of course the 2009 decline came at the time of the financial crisis in the U.S. During this time industry giants General Motors and Chrysler went bankrupt. While a slightly declining sales volume is not the biggest concern to American automakers, a loss of profit margins would be more threatening. Ripples of these tariffs should be felt throughout the industry as companies could suddenly be paying more for steel and aluminum. Concerns of protectionist trade policies and threats of a trade war is what seems to fuel concerns to the market. “For now, the more predictable forces of tax policy, fiscal policy, and monetary policy are overshadowed by the incendiary news flow and protectionist rhetoric,” said David Kotok (MarketWatch). So far, talk and implementation of steel and aluminum tariffs has been a boon to domestic steel prices. Since the beginning of the year prices are up about 20%. While tariffs should push manufactured steel and aluminum prices higher it should also push scrap metal prices up as well. Before the tariffs were announced, the scrap metal market was already off to a strong start in 2018. While we wait to see if there is any consistency in this market we are going in forecasting possible volatile times. So far, deal-making in the ferrous scrap market has been quiet. Sellers are holding out for more money and employing a wait and see strategy in order to hopefully take advantage of any strong upward potential. If we truly see some consistent strengthening to scrap prices, in the end of life vehicle market it could be a good time to sell your old junk car. 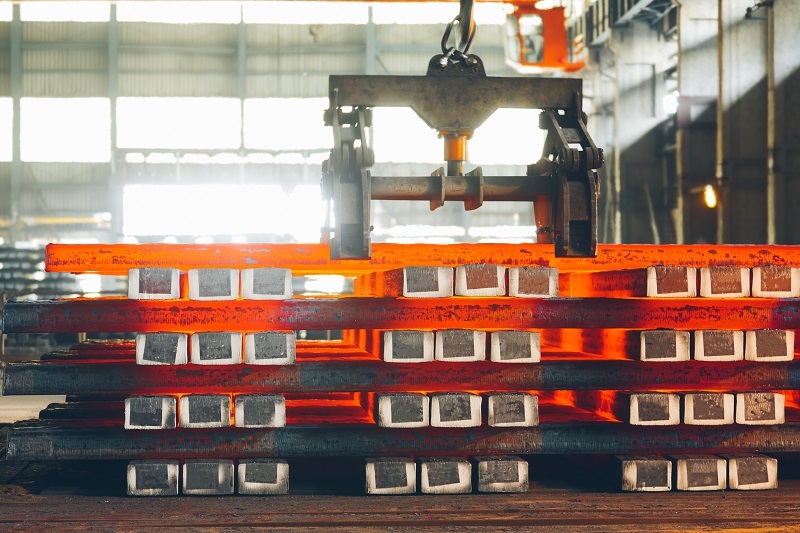 As more steel and aluminum tariff information comes out we can speculate better on the direction of affected industries. Combining this news though with what we already know about new car sales trending downward and record lease returns putting downward pressure on the used vehicle market we certainly anticipate there being a lot to consider going forward.